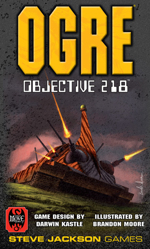 It's set in 2085 A.D., it's quick to play, and it's portable -- it's Ogre: Objective 218 and it's in stores now! We announced over a year ago that we would combine the world of Ogre with gameplay from modern classic The Battle for Hill 218. Now, we've done it, and you can buy the result. Place your units around a grid, keep your supply lines open, and use your Ogres and Cruise Missiles wisely to take out your opponent and win the day! You get all the staple units, like the G.E.V., Heavy Tank, Howitzer, and Ogre MK III in a package that takes about 30 minutes to play. Plan your moves, and find Ogre: Objective 218 at your Friendly Local Game Store today!